There are moments when the Universe throws a distinct pattern into my online adventures. Take the day that I saw Barb at Vino Luci Style’s post about French Onion Soup. In the post she provided a Sur laTable recipe for slow braised onions. Then over on Twitter, SmithBites was also talking about her love of the very same braised onions. In my world, two things make for a pattern. I know it’s not empirically sound, but it works for me. So I heeded the Universe’s pattern, bought a boatload of onions, and got to braising. As I type this, my onions are still doing their thing in the crockpot. It’s been almost 12 hours since I started them. Clearly, while this is an easy recipe it’s far from quick. But the beauty is that it makes enough braised onions to use for soups, sandwiches, salads, pizzas, or whatever you can imagine. Actually, I raided the crockpot a few hours ago and pulled out a bunch of onions to add to the chicken casserole I was making for dinner. After slicing up about a dozen onions, I had no desire to chop up another one. In the time that this post has been sitting in my ‘draft’ folder, I have started making braised onions on a regular basis. Every other week or so I tie the crock pot up for day so that I can have a steady supply of these. I have found that I use them interchangeably in recipes where onions are called for. These onions go so quickly that they have evaded my camera lens. The picture at the top of the post was some other recipe entirely, but it was the only photo of onions in my library. Deb at SmithBites has some lovely pictures of them in her post. So maybe you can mosey on over there and take a look. BAH Note: Unless you’re a glutton for punishment, or have onion goggles, I recommend using a mandolin to slice the onions. I give a range of how many onions to use. Start with the least amount and see how much space you have left in your crockpot. If you’ve got room for more, by all means add them. I didn’t think about this and came very close to having more onions than my crockpot could accommodate. Thankfully, the lid is somewhat domed so I was able to cram them all in. In hindsight, perhaps that’s why it took mine over 12 hours to braise. Slice the butter into tablespoons and place them on the bottom of your crockpot insert. Add the onions and thyme. Cover and cook on high for 2 hours. After 2 hours, stir the onions. Replace the cover and cook on high, without stirring, for another 6 to 8 hours until the onions are tender. If you still have a lot of liquid in the crockpot, remove the lid and cook on high for an additional 1 to 2 hours or until most of the liquid has evaporated. Turn the crockpot off and let the onions sit uncovered for 1 hour to cool. Transfer to quart jars or plastic containers and store in the refrigerator. Yum! It sounds like you go through them pretty quick, but about how long do you suppose you could keep them in the fridge? It does seem like a handy thing – so many recipes start with cooking some onions. 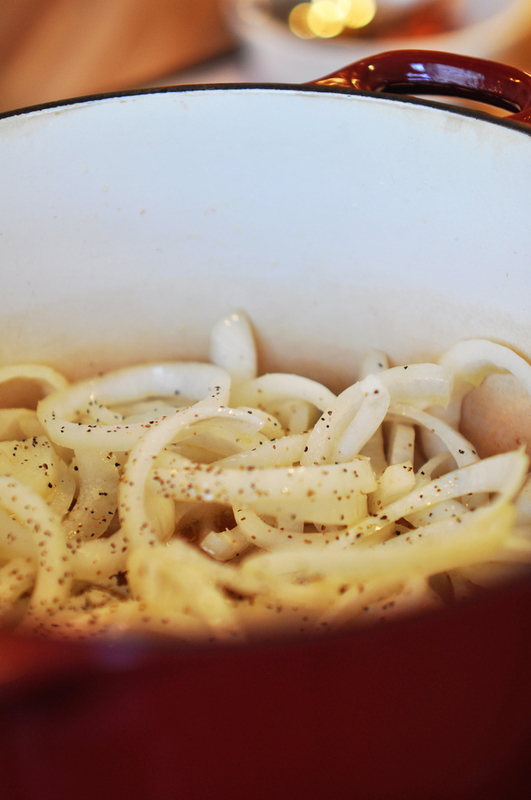 Here are my two onion slicing tips – 1) burn a candle at the same time. The fire actually burns up some of the compounds that make you cry and if you use a scented candle it masks some of the onion smell. 2) Rinse onion halves and your knife with water. The water holds the compounds down. Jen, I divide my stash between the fridge and freezer. I have been known to keep some in the fridge for a week or two. But that’s about as long as I would feel comfortable saying they would be ok to use. I think there is some scientific gobbledygook to the idea of rinsing the knife. Something about the volatile compounds in the onions bond with water…which is why they make your eyes water. i must know, how does your abode smell??? i bet so flipping GOOD! i read in some food mag once that the writer would sautee up some onions just prior to the guests arriving to make the abode smell all sorts of homey & good, adding to the whole faceade that his food delish. i know you personally & know that you cook fabulously, you don’t require such “trickery” but everytime i cook up some onions i am reminded of this article & how it really does make the kitchen space all awesome smelling. PS. i heard that freezing onions helps with no tears when cutting them…. You want the truth Lan? It makes my entire house smell like onions and it takes forever for that to go away. In small doses, I agree it could be a very welcoming smell. But when my towel smells like braised onions days later….that’s a problem. Just one challenge of the small house and no exterior venting in the kitchen. I just made some caramelized onions and mushrooms yesterday at my in-law’s and instead of satisfying my craving for onions, it’s just made my craving that much stronger! Your slow cooked onions sound divine. Jenna, funny how the Universe works isn’t it? I will say that if you make a batch of these, you can satisfy your cravings for quite a while. Jen, if you commit to a batch of braised onions you will find that you use them in everything. I was tempted to throw them in my mac and cheese yesterday….but I didn’t. Nice one. Crock potting a couple of kg’s of onions & caramelising them for ‘later’. Awesome idea. Pizza would be great. I used them for a puff pastry tart.